In the summer of 1960, 26-year-old Jane Goodall arrived on the shore of Lake Tanganyika in East Africa to study the area's chimpanzee population. 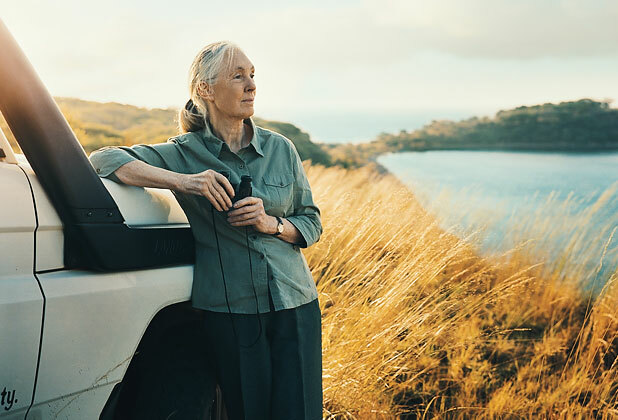 Although it was unheard of for a woman to venture into the wilds of the African forest, the trip meant the fulfillment of Jane Goodall's childhood dream. Jane’s work in Tanzania would prove more successful than anyone had imagined. At first, the Gombe chimps fled whenever they saw Jane. But she persisted, watching from a distance with binoculars, and gradually the chimps allowed her closer. One day in October 1960 she saw chimps David Graybeard and Goliath strip leaves off twigs to fashion tools for fishing termites from a nest. Scientists thought humans were the only species to make tools, but here was evidence to the contrary. On hearing of Jane's observation, her mentor Louis Leakey said: "Now we must redefine tool, redefine man, or accept chimpanzees as humans." 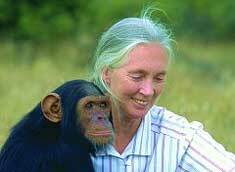 Also in her first year at Gombe, Jane observed chimps hunting and eating bushpigs and other animals, disproving theories that chimpanzees were primarily vegetarians and fruit eaters who only occasionally supplemented their diet with insects and small rodents. Through the years her work continued to yield surprising insights, such as the unsettling discovery that chimpanzees engage in a primitive form of brutal “warfare.” In early 1974, a "four-year war" began at Gombe, the first record of long-term warfare in nonhuman primates. Members of the Kasakela group systematically annihilated members of the "Kahama" splinter group. Dr. Goodall would also chart surprising courtship patterns in which males force females onto consortships in remote spots for days or even months. And she and her field staff in 1987 would observe adolescent Spindle "adopt" three-year-old orphan Mel, even though the infant was not a close relative. 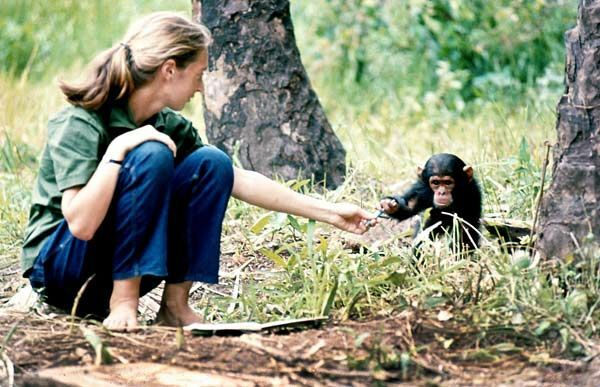 In 1977, Jane founded the Jane Goodall Institute for Wildlife Research, Education and Conservation to provide ongoing support for field research on wild chimpanzees. Today, the mission of the Jane Goodall Institute is to advance the power of individuals to take informed and compassionate action to improve the environment for all living things. The Institute is a leader in the effort to protect chimpanzees and their habitats and is widely recognized for establishing innovative community-centered conservation and development programs in Africa and the Roots & Shoots education program in more than 70 countries. Dr. Goodall's scores of honors include the Medal of Tanzania, the National Geographic Society's Hubbard Medal, Japan's prestigious Kyoto Prize, the Prince of Asturias Award for Technical and Scientific Research 2003, the Benjamin Franklin Medal in Life Science, and the Gandhi/King Award for Nonviolence. In April 2002 Secretary-General Annan named Dr. Goodall a United Nations “Messenger of Peace.” Messengers help mobilize the public to become involved in work that makes the world a better place. They serve as advocates in a variety of areas: poverty eradication, human rights, peace and conflict resolution, HIV/AIDS, disarmament, community development and environmentalism. In 2003, Queen Elizabeth II named Dr. Goodall a Dame of the British Empire, the equivalent of a knighthood. Dr. Goodall has received honorary doctorates from numerous universities, including: Utrecht University, Holland; Ludwig-Maximilians University, Munich; Stirling University, Scotland; Providence University, Taiwan; University of Guelph and Ryerson University in Canada; Buffalo University, Tufts University and other U.S. universities. Dr. Goodall's list of publications is extensive, including two overviews of her work at Gombe—In the Shadow of Man and Through a Window—as well as two autobiographies in letters and a spiritual autobiography, Reason for Hope. Her many children's books include Grub: the Bush Baby, Chimpanzees I Love: Saving Their World and Ours and My Life with the Chimpanzees. The Chimpanzees of Gombe: Patterns of Behavior is recognized as the definitive work on chimpanzees and is the culmination of Jane Goodall's scientific career. She has been the subject of numerous television documentaries and is featured in the large-screen format film, Jane Goodall's Wild Chimpanzees (2002). Today, Jane spends much of her time lecturing, sharing her message of hope for the future and encouraging young people to make a difference in their world.